Since the gorilla Harambe was killed at the Cincinnati Zoo in May, his death has taken over the internet in the form of an unending meme. It grew so overwhelming for the zoo that they even closed their social media accounts. 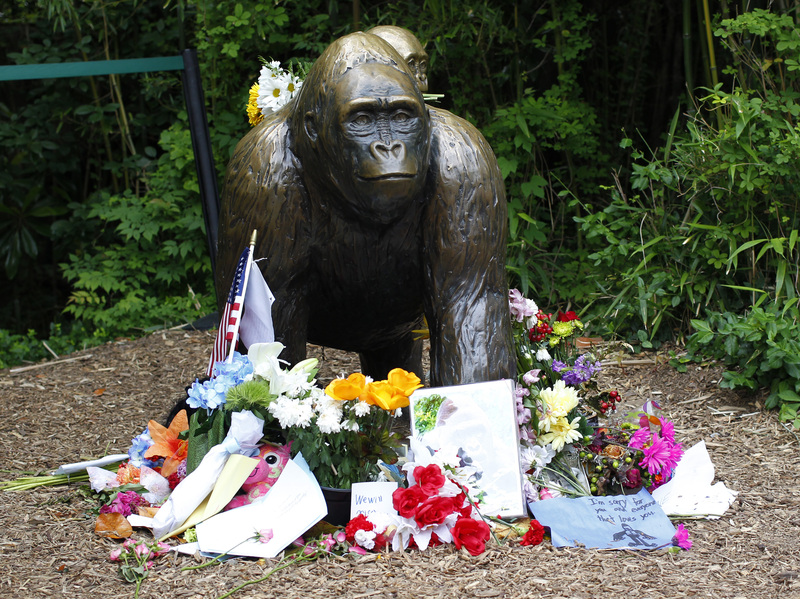 The zoo's director, Thane Maynard, told the Associated Press that the zoo is "still healing." But unless they institute a dress code at the zoo, there might be no way to avoid Harambe's ongoing cultural influence. That's because now there are now "I'm With Harambe" shirts flooding Amazon. They are exactly what they sound like. It's a parody of the Hillary Clinton campaign logo, complete with the arrow through the "H." The only difference is that the "H" begins "Harambe" and there's a picture of the gorilla in the top center of the "R." This may prove Venkatesh Rod's point in The Atlantic: Harambe is the perfect meme. "Harambe is the message that became a medium, capable of carrying any signal, without becoming identified with any of them," Rod wrote. To many this a harmless joke, but to some, it is far more than that. At the University of Massachusetts Amherst, two RAs sent emails to their residents that said Harambe jokes would not be tolerated because they could be seen as microagressions to the school's African-American community. They wrote "any negative remarks regarding ‘Harambe’ will be seen as a direct attack to our campus’s African-American community." Later the school issued a statement stating there's no ban on Harambe humor. The Cincinnati Zoo, given their stance on social media memes, may also find shirts like "I'm With Harambe" offensive. New York Mets pitcher Noah Syndergaard recently wore an "RIP Harambe" shirt to the zoo, posting a picture on Instagram that blurs out his crotch while he stands next to a statue of the gorilla. One of the more offensive Harambe memes making the rounds in recent days has called on men to expose themselves "in support" of the gorilla. The zoo's exhibit reopened in June with a higher barrier in hopes to prevent other children from falling into the enclosure. That's what happened when Harambe was shot, a 3-year-old boy got away from his mother, got through some bushes, and fell 15 feet into the moat. The zoo staff decided to shoot the gorilla after he began to push the boy around. Maynard insisted at the time that the decision was the correct one, as the boy was in danger. But it has been difficult on the staff. "This is a very emotional time at the Cincinnati Zoo. It is a big loss to the Cincinnati Zoo," Maynard said in a statement. "Harambe was one of our most magnificent animals." So if you do decide to order a T-shirt, may I recommend you keep your pants on and not wear it to a zoo near you.